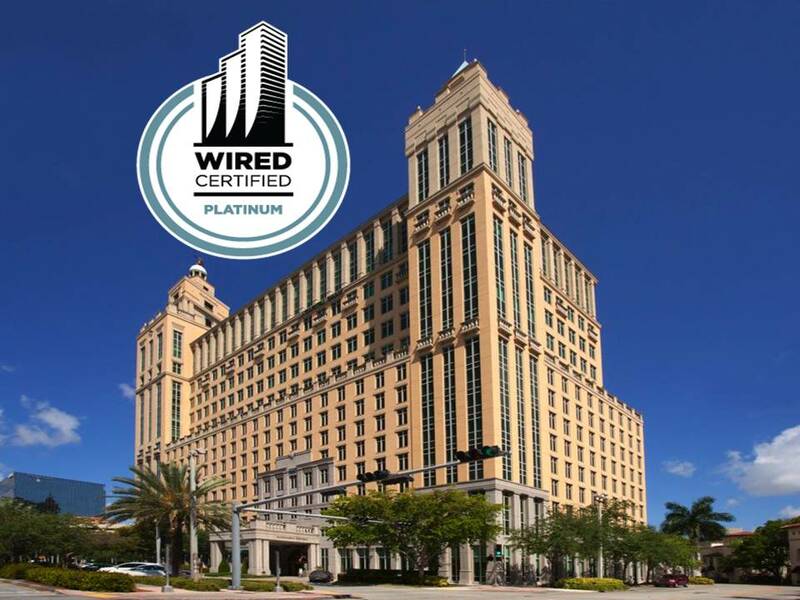 WiredScore, the certification program launched by Jared Kushner, Michael Bloomberg and the New York City Economic Development Corporation that identifies and certifies buildings with the most cutting-edge internet connectivity, has announced that Alhambra Towers in Coral Gables has achieved Platinum Wired Certification, making it the first building in Coral Gables and the second in Florida to receive the coveted Platinum ranking. Alhambra Towers now joins a distinctive group of technologically advanced buildings around the world, including the Empire State Building and the Willis Tower, among many others. To achieve Wired Certification, properties must meet a rigorous set of standards developed in conjunction with the top minds in the telecommunication and commercial real estate industries. Alhambra Towers was able to meet these standards and earn the highest obtainable distinction of Platinum due to its five fiber providers, which ensure business-grade internet access; placement of its telecom equipment, which is protected from possible flood damage; and fixed wireless connectivity, which guarantees an independent internet line, amongst other features. As one of the Miami area’s most distinctive commercial buildings, Alhambra Towers is a class A-plus luxury office building featuring Spanish-inspired architecture and a comprehensive suite of world-class amenities. For more information visit http://alhambratowers.com/. WiredScore powers the economic engine of cities around the world by championing cutting-edge tech infrastructure in commercial buildings. Launched in 2013 in partnership with the City of New York, WiredScore is the pioneer behind the international Wired Certification standard that evaluates and distinguishes best-in-class internet connectivity in commercial buildings. Connectivity is a critical need in an increasingly tech-driven economy, and the widely recognized Wired Certification seal is a trusted symbol that Identifies buildings that have been independently certified to provide the leading-edge internet infrastructure that businesses require to thrive. More than 650 properties—totaling 250 million square feet of office space in over 50 cities—have achieved Wired Certification through providing superior tech capabilities for their tenants.